Hi WooCommerce store owners, the 2.3.8 Plugin release is a minor Plugin update adding additional export functionality, that means native export support for WooCommerce Easy Bookings, additional export columns and new Scheduled Export controls. Hi WooCommerce store owners, the 2.1.7 Plugin update is an urgent Plugin release which resolves a timeout issue introduced in the last minor Plugin update affecting large exports. If you are experiencing 504 Gateway Timeout or similar timeout errors after updating to the 2.1.6 Plugin release please update to the 2.1.7 Plugin release. Hi WooCommerce store owners, the 2.1.6 Plugin update is a minor Plugin release extending Scheduled Exports and exposed additional WordPress Filters for WordPress Theme and Plugin developers to hook into. 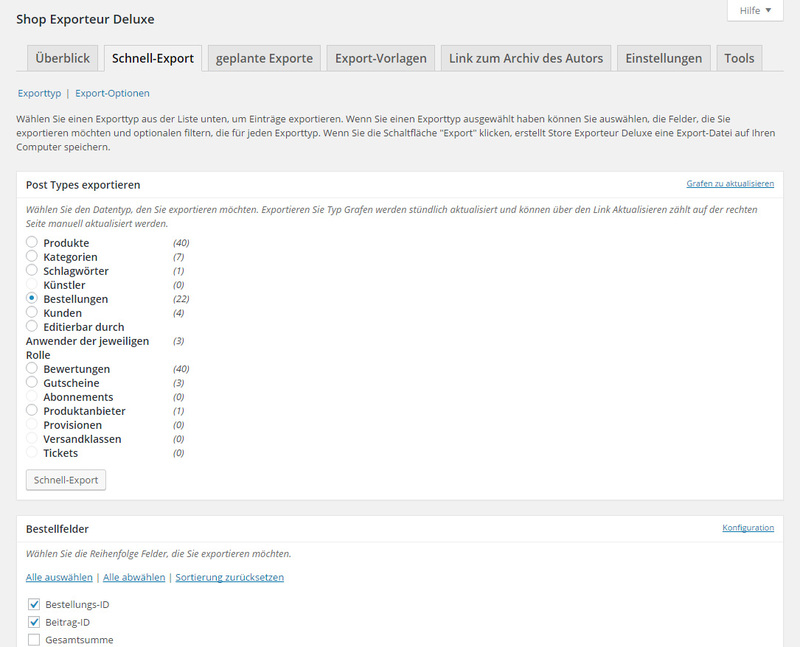 You can now export Product Add-ons within the Products export type. Hi WooCommerce store owners, the 2.1.5 Plugin update is a minor Plugin update extending the functionality and filters available within the Edit Scheduled Export and Edit Export Template screens. You can now re-order (drag-and-drop) export fields on the Edit Export Template screen and filter Scheduled Exports to run on specific days of the week. With the 2.1.5 Plugin release you can choose what days Scheduled Exports run on, for instance if you do not want FTP uploads going to your supplier on weekends then simply exclude Saturday and Sunday from the Edit Scheduled Export screen. Just like you can re-order export fields to your liking on the Quick Export screen the same can now be done from the Edit Export Template screen, simply drag-and-drop the export fields then click Publish/Update to see those changes reflected in Scheduled Exports. Hi WooCommerce store owners, the 2.1.4 Plugin update is a minor Plugin update extending the functionality and filters available within the Edit Scheduled Export and Edit Export Template screens. That and we’ve fixed multilingual support and have included the Deutsch language pack in this release (thanks Thomas)! The biggest change in this release is the change of export field labels affecting the Orders export type. Things got a little confusing when users were wanting to export the Attribute details from a Product that was included as an Order Item as opposed to what we were offering which was the Variation detail chosen by the customer and assigned to the Order Item. The first item is the Colour Variation selected by the customer as part of their Order, the second item is the Attribute data linked to the Product that the customer added to their Order. Hi WooCommerce store owners, the 2.1.2 Plugin update is a minor Plugin update that extends the Scheduled Export engine with new Filters, Volume Limit and Offset support and reporting on failed Scheduled Exports. Note: The 2.1.2 Plugin update does not include the anticipated Export Templates which is currently being developed. We’re as eager as you to see it released! In additional to monitoring Scheduled Exports from the Scheduled Exports and Recent Scheduled Exports Dashboard widgets you can now see all Scheduled Exports activity and reporting from the Scheduled Exports screen. We now include detailed reporting on failed Scheduled Exports on the Scheduled Exports screen, prior to this we relied on the WooCommerce Logs engine and WordPress Logs file. If a Scheduled Export fails it is highlighted in red with information about the issue and where possible clear recommendations on how to resolve the conflict. You can limit access to the Scheduled Exports and Recent Scheduled Exports Dashboard widget by modifying the woo_ce_admin_dashboard_user_capability WordPress Filter. The 2.1.2 Plugin update added WordPress MultiSite support for Network Admin’s to export Products, this will be extended in future minor Plugin updates to support all other Export Types.